Plastic Water Tanks: Does the color matter? This is an important question to ask yourself if you are concerned about the purity of your water. Water tanks come in many shapes and sizes. They are used for many applications across the country providing an extra water source in a time of need. Drier states like Texas, Arizona and California use plastic water tanks as an emergency backup plan. Believe it or not, for some farmers and ranchers, this is their only source of fresh water. What colors do water tanks come in? Plastic water tanks come in many different colors. However, there are certain colors in today's market that work wonders to keep your water pure. For instance, Enduraplas offers a range of total block out colors that eliminate any sun penetrating the water. We call this Light Block™ technology. When sun comes in contact with water, algae growth begins. 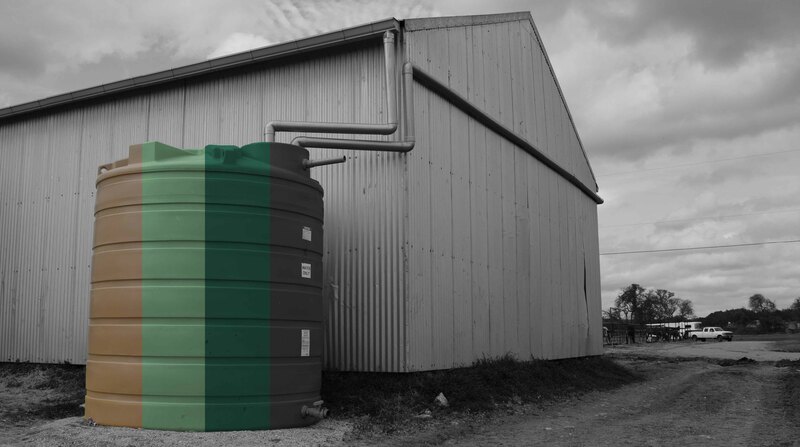 Why would the color of your Water Tanks matter? The right color will block out sun eliminating algae growth. Choosing the right color to blend into the environment is also important. What other important facts should you know about Plastic Water Tanks? Other than the color of your water tanks, there are 2 decision making factors that come to mind. Check out this blog I wrote that has answered a lot of lingering questions. It is called, What type of Water Tank is best for rainwater harvesting? [Blog]. This highlights extra features the Enduraplas water tanks provide.